You will have an inkling of the ending but you will not be right. Not his best. Predictable and too long for nothing. Amazing story! I could not stop listening! 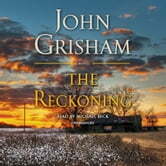 I love all Grisham’s books but I think this is his best yet! Sorry that it had to end!